Looking back at 2012… well, I haven’t been around much on the blog, have I? A technical problem with what I wanted to do with the next blog post led to me putting it aside until I had time to work out what was up. Then I got busier. Unfortunately two projects I was involved with look to be dead. One was an app which I did some graphic design work for, and the other was a charity art book similar in vein to the Transmetropolitan one I worked on back in 2011. It required copyright clearance from a licensee before we could proceed. We got the clearance and started on gearing up a very cool book only to have the licensee rescind the permission three months later, with zero explanation. One part of me just shrugs and says “them’s the breaks”, but another part thinks the licensee can bite me. Sorry, but it’s not worth the trouble to give specifics. There was some CCG art for an app. Unfortunately, that’s not out yet so I can’t share that with you either. Sheesh. 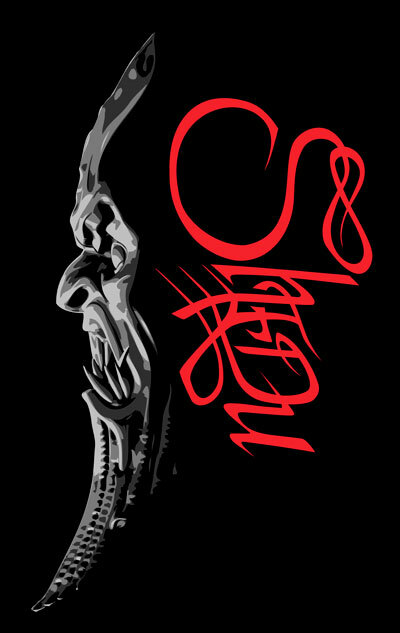 I did a cover for a local metal band called Shedu. Portions of the cover can be seen at the top of their webpage – which you can find right here. Give them a listen. The image on the right is a quick something I whipped together for their EP. I should mention that the monster is my doing, not the band name treatment which is a friend’s handiwork. The first of these is a puzzle book that I’m illustrating. It should be launching on Kickstarter before January is out. More news on that soon. The second Kickstarter project is an art book celebrating the original artists of Magic: the Gathering and commemorating the 20th anniversary of the game. 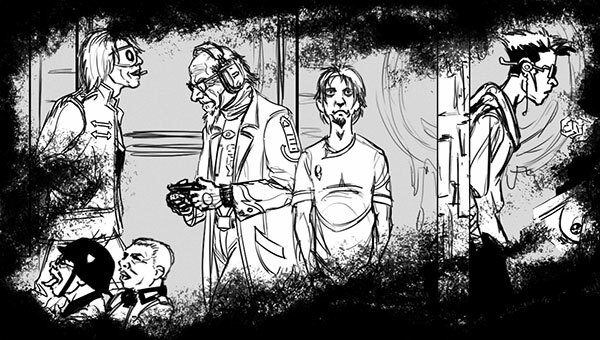 It includes new art from 30+ of the original artists done especially for the book, along with anecdotes and insights into their art and their experiences with the game. It’ll be on Kickstarter very soon – hopefully February. When the launch is near, you will know. Trust me. There’s now a site dedicated to Magic original art. They interviewed me and you can find that here at the Original Magic Art site. Anyway, that’s it for now. I’ll be back soon with more info about my first Kickstarter project. Man, that was a fast week. So it’s the last of my Transmet Art Book previews and I figured we’d end where we began, with Spider Jerusalem, this time accompanied by Yelena. Spider seems to have exchanged his furious expression for… well, what is that expression? Annoyed? Repulsed? You tell me. 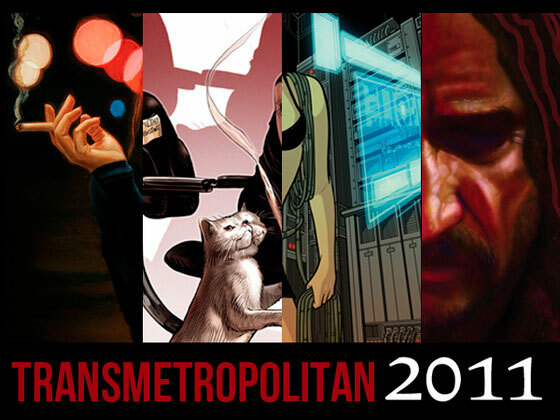 So, follow this link to the Transmet Art Book on Kickstarter. It’s for Charity! Hurry, time is running out. It’s that gecko-eating cat! He’s looking none too pleased and when you see the final piece you’ll see he’s on the receiving end of some payback. The lounging pose with one hind leg dangling was modeled by my completely graceless cat, Trinian. As we’re at the halfway point of sneak peeks, here’s something a little different. This is a small snippet of a sketch of something else I’m doing for the Transmet Art Book that’s not actually part of my double page submission. If you’re a big fan of Transmet you may recognize some faces. 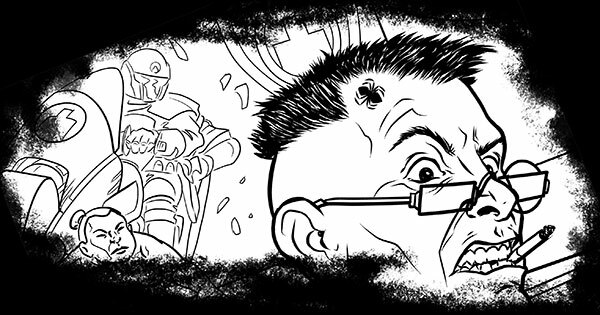 Firstly, many thanks to Warren Ellis for showing yesterday’s sneak peek on his blog! 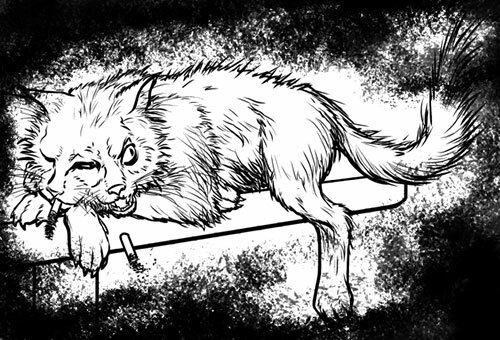 And yes, we totally met doing vampire graphic novels for Tundra UK. 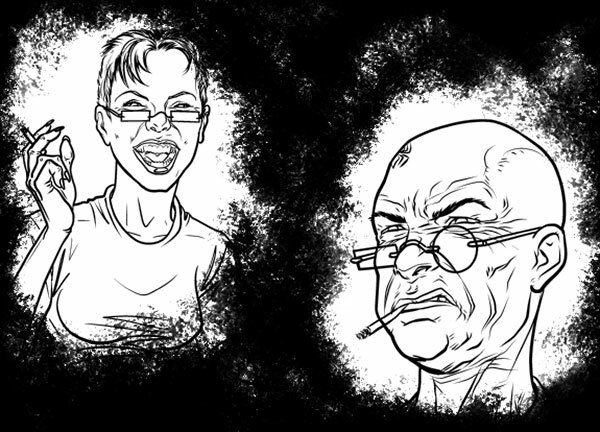 Buckle yourself in because this week you’re gonna get daily previews of the linework from my pieces (yes, plural) in the Transmetropolitan Art Book. Don’t know what that is? 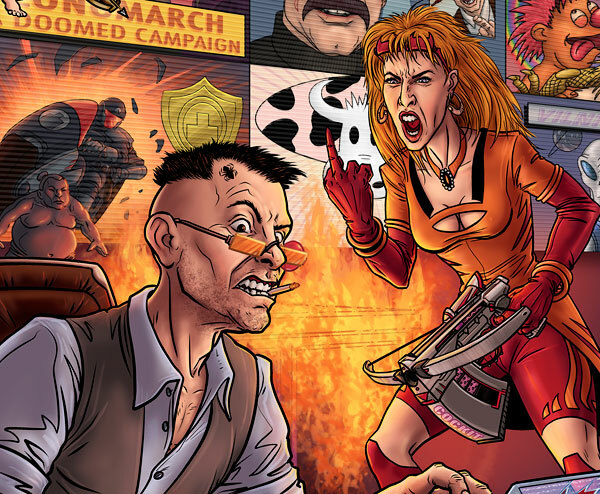 Well, Transmetropolitan was a comic book set in the not too distant future and it’s lead character is Spider Jerusalem, an honest-to-god investigative journalist living in a world where news is just the pap that the newscorps want you to see (sound familiar?). The comic – created by Warren Ellis & Darick Robertson – ran from 97 to 02 and if you’ve never read it you owe yourself this treat. Trust me. It has a brutally wicked sense of humor. I love it. Anyway, this art book is not only a celebration of Transmetropolitan, it’s also for a damn good cause. The proceeds from the book go to the Comic Book Legal Defense Fund (who protect comics-related first amendment rights) and the Hero Initiative (which “creates a financial safety net for yesterdays’ creators who may need emergency medical aid, financial support for essentials of life, and an avenue back into paying work. It’s a chance for all of us to give back something to the people who have given us so much enjoyment”). And it’s all being funded through Kickstarter, a brilliant new way for creatives to fund their projects. Here’s the link to the Kickstarter page for the Transmet book. And you don’t have to give them any of your credit card info as checkout is actually run through Amzon’s checkout system so if you already have an Amazon account, it’s just a matter of registering at Kickstarter to get your copy. And remember, your donation (of $55+) is your preorder. Feel free to throw out some guesses as to what the hell is going on! 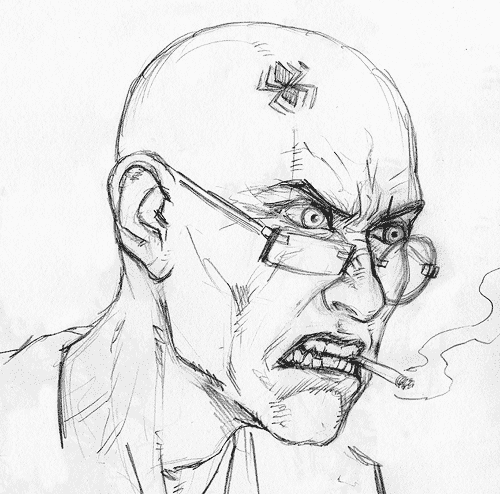 While I’m busy scanning and collating a large pile of images for a series of blog updates in the not-too-distant future, here’s a quick sketch of everyone’s favorite misanthropic journalist – Spider Jerusalem. 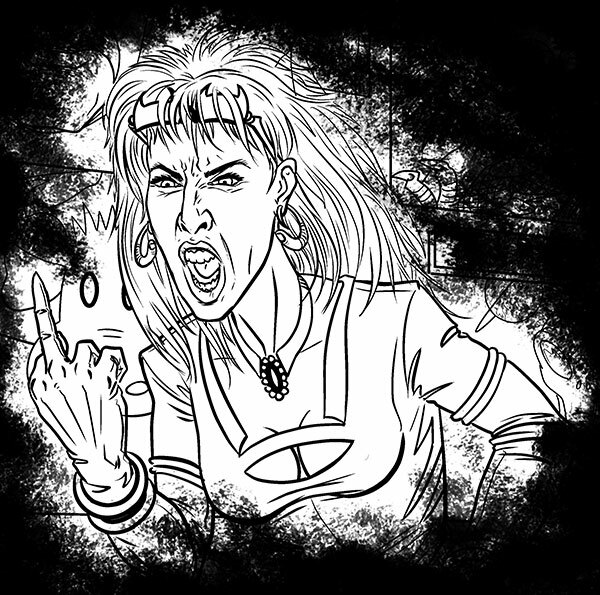 This isn’t an image from the upcoming Transmetropolitan Art Book , it’s just me warming up and getting used to drawing the character’s face. The production of the book is being funded by using Kickstarter. Check out the right column on the Kickstarter page to see how you can donate and ensure yourself a copy of this very limited edition book.